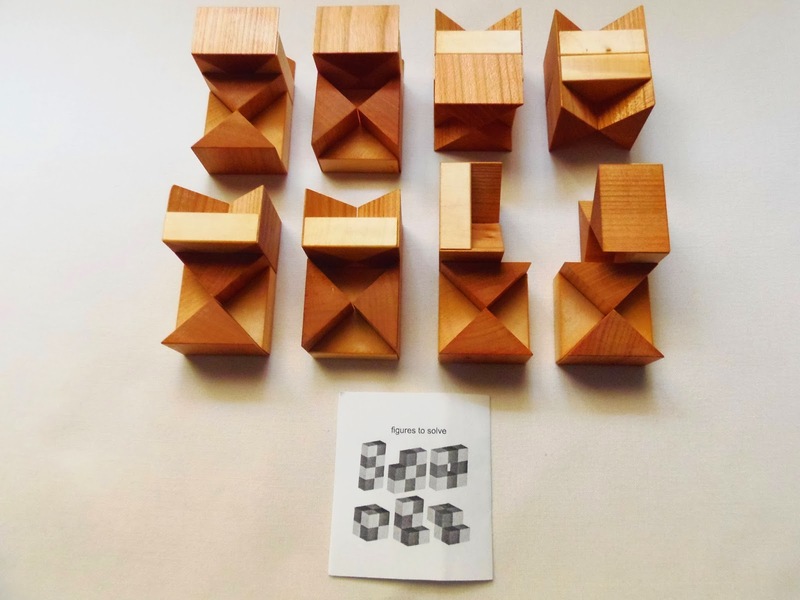 Vinco's (Václav Obšivač) craftsmanship is so well known and characteristic that his puzzles are easily among the most recognizable in the puzzle community. He uses different wood tones to create all these beautiful geometric patterns and sharp contrasts that it's hardly seen anywhere else. Another subtle characteristic of his work that's only noticeable with touch is the use of wax in the pieces, which not only helps to preserve the wood, but also makes it easier to slide the pieces in place. Theo's Halfcubes is not a coordinate motion puzzle, unlike many of Vinco's designs. Instead, you'll be using its eight pieces to assemble them into several different shapes, including a cube, already assembled in the package. Like the name suggests, Halfcubes was made in collaboration with another great puzzle designer, Theo Geerinck. If one great puzzle designer can do wonders on his own, what could possible be achieved when two of them work together? Each of the eight pieces comprising the puzzle consists of two halfcubes joined together at different angles. If you were to join two halfcubes you'd get a perfect little cube. You can actually see all possible combinations, since each piece is unique. What's fascinating about the puzzle is that you are not restricted to build just a cube out of the eight pieces. In fact, there's at least six different shapes you can attempt to solve, the cube included. To build a shape you have to keep in mind not to leave any inner parts exposed (the two opposing triangles). You can join any two pieces together by simply connecting them with opposite triangle orientations. 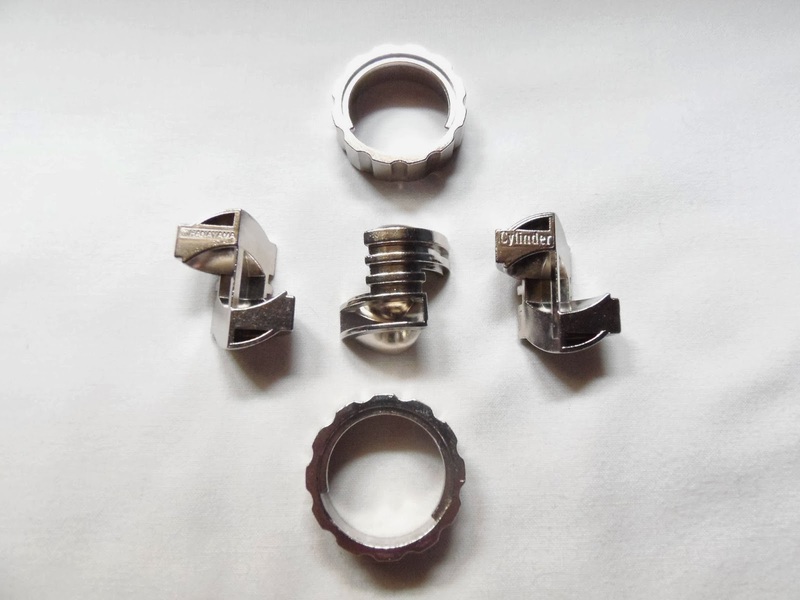 The cut tolerances are mostly very good and the pieces will stay connected unless you really want to take them apart. Solving any of the shapes isn't an easy task. Be prepared for a lot of experimentation as you go, connecting and disconnecting pieces along the way. I was able to make two extra shapes, a square with a hole in the center and a heart, and both took about 15 minutes each to accomplish. I found the heart a bit easier, but my guess is that it was pure luck. I can't be sure if it's possible to build more than the six available shapes, because of the exposed inner parts. I tried but didn't come up with anything. Nevertheless, these will be enough to give you good value for your money. Theo's Halfcubes is a welcome change in Vinco's portfolio. It still shows his characteristic work, but brings something new and original which is great considering the hundreds of different designs in his name. As for Theo Geerinck, be on the lookout for more collaborations between these two designers. There's at least two more out there, Theo's Octopus and Theo's Box. Availability: Theo's Halfcubes can be purchased from Sloyd for €22.18. The Cast Cylinder is Vesa Timonen's latest contribution to the ever growing series produced by Hanayama. Launched in August 2013 as the 60th puzzle in the series (if my calculations are correct), the Cylinder has a very interesting design and concept. Like many others in the Hanayama collection, the appearance of the Cylinder doesn't give you any hints as to how it should be solved. Luckily, and unlike Hanayama, they give you a pretty good hint in the description that will sure help you with your task. The theme for this puzzle is "lock". The Cylinder is presented in a chrome color and consists of two rings that rotate freely in 360º. Within the rings are three apparently similar pieces that don't appear to be affected by the rotation of the disks. These pieces don't move up or down, and the rings can't be separated either. With a little persistence, however, you'll see that the pieces can actually be moved. That's when the Hanayama hint in the puzzle's description comes in handy. This is a quote from the actual description: "go about it as if you were cracking open a safe". That's also why I mentioned this is unlike Hanayama. They don't usually give out hints for solving their puzzles, so I was a bit surprised by it. Following this important piece of information I proceeded slowly by rotating one of the disks until I saw something that could indicate I was on the right path. I'm not sure how many complete turns I made with the ring, but it took me a while to finally see some progress. Eventually, one of the three pieces slid down a bit and I was ecstatic. I wasn't sure what do next, so I continued and tried to see if one of the other pieces would fall down as well. No luck this time. After some more fiddling I was able to find out that the piece that had slid down could rotate independently from the rings. Again, after doing this for some time, another piece slid down. The two pieces were now side by side with only the third one still in its original position. Some more fiddling and now one of the pieces had fall down even further. The three pieces were now in a cascade, each one lower than the other. From here, the puzzle was a step closer to being solved. It wasn't long before I could remove the first piece and then the remaining two. A couple of extra steps were needed, but I won't reveal all of the solution for you. Now, all I had to do was putting the puzzle back together again. You'd think that'd be easy after seeing the internal mechanism, wouldn't you? Well, all I can say is that this task is even harder than taking it apart. I can't remember the order in which the pieces were removed, and the process is anything but straightforward. I tried to follow a solution guide, but that only includes the description of the solving process and doesn't show which piece is first removed. Note that two of the pieces are identical. So, as of now, the puzzle hasn't still returned to its former glory. Solution: If you find yourself stuck you can download the solution here. The Cast Cylinder is quite difficult to solve but, to my surprise, I'm finding it ten times harder to put it back together. This is classified as a difficulty level 4/6, and I agree with it if you're only taking it apart. However, doing the reverse is as difficult as any of the 6/6 level puzzles. Prepare for some frustration with this one. 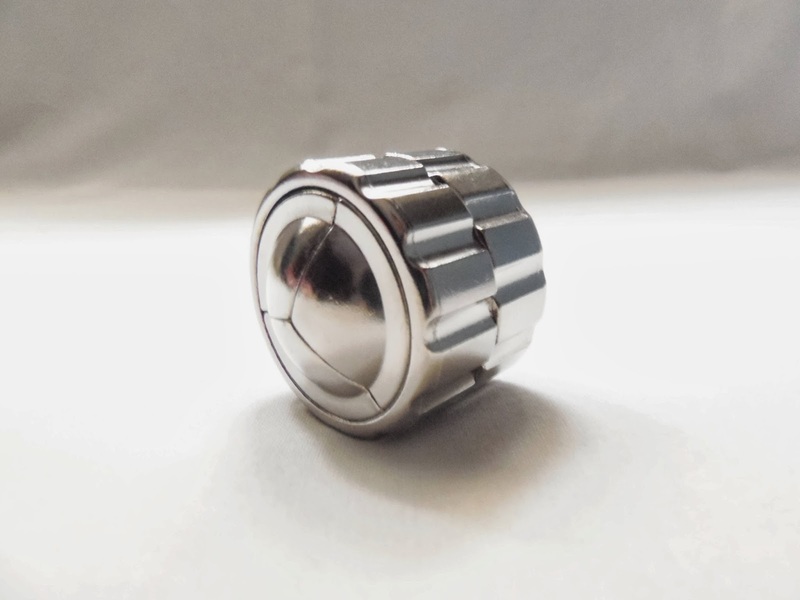 Availability: You can find the Cast Cylinder and all the others in the Hanayama series at PuzzleMaster. Ever since I started reviewing Siebenstein-Spiele's puzzles I always pointed to the fact I liked their designs because it reminded of Jean Claude Constantin's puzzles. 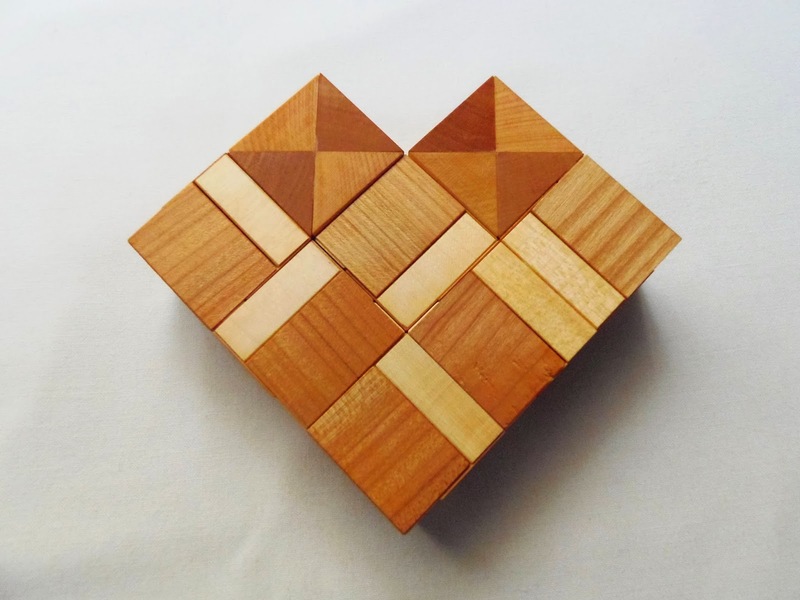 There are many similarities between their work, as they use mostly wood as the main material for their creations, including various types of wood in a single puzzle. Ultimately, their designs seem unique, but there have been a couple of designs lately that makes me think their similarities are way too obvious to be a coincidence. My only explanation is that both designers, Constantin and Jürgen Reiche, have been working closely together on their designs a few times. 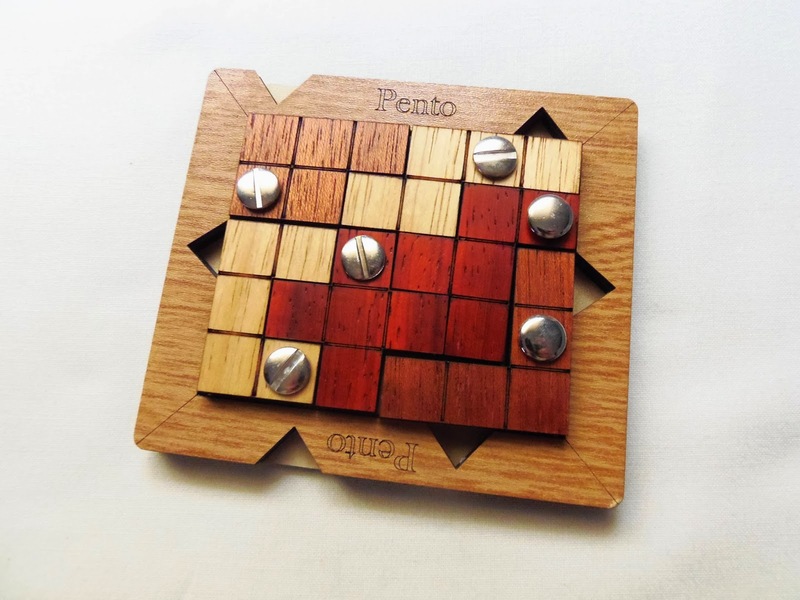 Pento, a puzzle produced by Siebenstein-Spiele uses the same basic concept introduced by Constantin in his puzzle Doppelschicht. Or maybe it's the other way around... I'm not sure if this is a good or a bad thing, considering the high quality and originality of both designers' work. 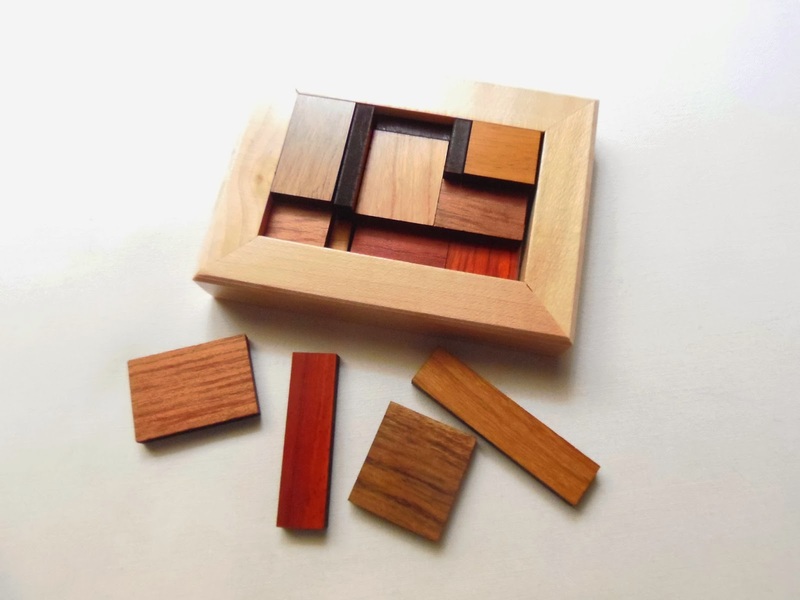 Like mentioned above, one of the best qualities of Siebenstein's puzzles - or Constantin's, for that matter - is their presentation, always using different wood colors to emphasize the overall design. Pento is no different, using three different wood tones for the pieces plus the glazed light tone for the tray. The metal screws also work great for contrast against the wood, adding the final touch of elegance into the design. 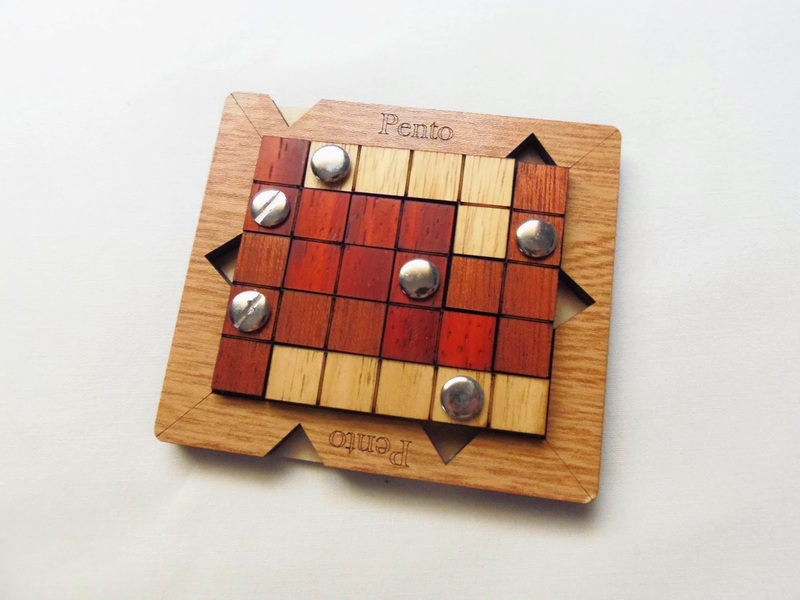 The name Pento is given because of the nature of its pieces, which consists of six double pentominoes. Yes, double pentominoes. Just like its cousin Doppelschicht, each of Pento's pieces consist of two pentominoes hinged by a screw. This allows the pieces to be rotated in any direction, making it difficult to find their correct arrangement once out of the tray. You have to think like you're solving two puzzles simultaneously, and that's exactly what you'll be doing - solving two packing puzzles at the same time. Fortunately for me, I found the Pento puzzle easier to solve than the Doppelschicht - I can't believe I can write the word without a typo - but it was still quite challenging. Believe it or not, the position of the screws work more in your favor than against. They're strategically placed in one of the piece's units, and depending on their position on the tray, not every position will work for both pentominoes that comprise a single piece. You can use that to your advantage, making the puzzle easier as you go with less and less possible arrangements. Of course, like any other packing puzzle, you have to rely heavily on trial and error, but with six pieces - well, twelve actually, they're double pentominoes - I reckon it won't be a problem for a seasoned puzzler. Still, it took me about an hour to solve it. The manufacturer rates it as a level 5/7 - strange scale - which I believe is pretty accurate. I'm still on the fence about the obvious similarities between both designers' puzzles. It seems like déjà vu, and doesn't give you a satisfactory feeling like you're facing something completely new. Not every puzzle has to look completely different. I know that. But I expect much more from both designers. 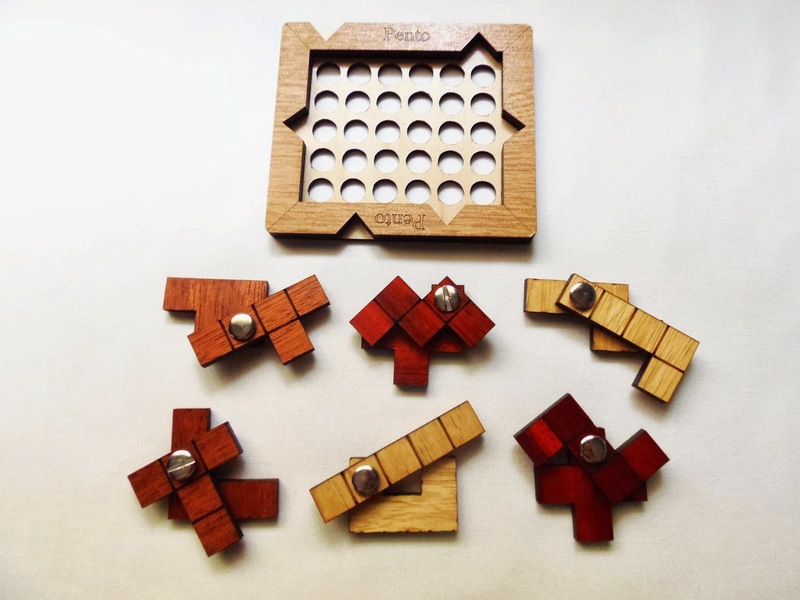 Availability: The Pento puzzle is available at Sloyd for €17.50. 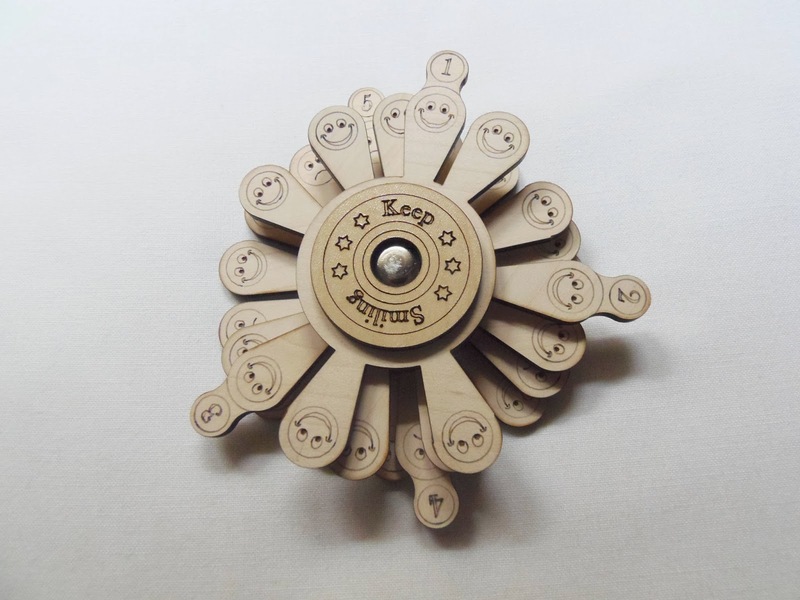 Keep Smiling is a cute little puzzle, produced by Siebenstein-Spiele and designed by Jürgen Reiche, that will sure cheer you up anytime you try to solve it. The concept is not new. In fact, Jean Claude Constantin has a very similar design, the Marguerite, but Siebenstein's version is a little better in my opinion, with more character and style. The puzzle is made from five wooden disks stacked on top of each other, each layer showing a combination of sad or happy faces. The #1 and #2 layers both have four tabs arranged with different layouts; #3 and #4 layers have five tabs each; and finally, the #5 layer has all fifteen tabs along the perimeter of the disk. 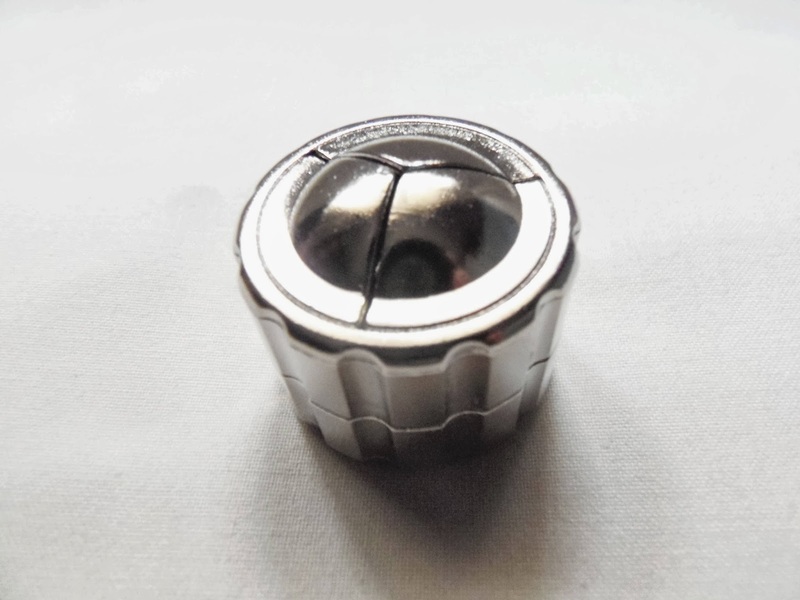 All disks are held together by a pin, but they can be rotated freely in 360º. The rotation is smooth and without much friction and a longer, numbered tab is present in each disk to maneuver the puzzle more easily. The goal is to move all disks into a position where only happy faces are showing. Will you be able to keep everyone happy? The puzzle is surprisingly challenging and, considering I had solved the Marguerite puzzle, I was even more surprised by it. For all it's worth, I reckon Constantin's design is much more simple. In it, all you have to do is getting all petals evenly spaced out. However, Keep Smiling is a little more complex. You have to not only worry about the position of the tabs, but at the same time making an effort not to leave any sad face showing. Solving the puzzle, as expected, involves a little of trial and error, but also careful inspection. First, you need to think about the difference between the sad faces and the happy faces. As I mentioned above, the length of each disk has space for fifteen tabs, but only the fifth disk carries all of them. As an obvious deduction, this indicates that you must show fifteen happy faces. An easy count reveals that there are seventeen happy faces and sixteen sad faces. That's one more happy face than sad faces, but the result is meaningless, really. I have tried many combinations, but only found one that showed all fifteen happy faces. I'm very confident that the puzzle only has one possible solution, which makes it that more challenging. The effect, once solved, is definitely nice to look at. Keep Smiling is not that original a design, but still, I liked the different theme Siebenstein chose for it, keeping it fresh and challenging. The puzzle's simple concept makes it easy for anyone to understand and want to try it, but not everyone will succeed. It's up to you to make all faces happy. 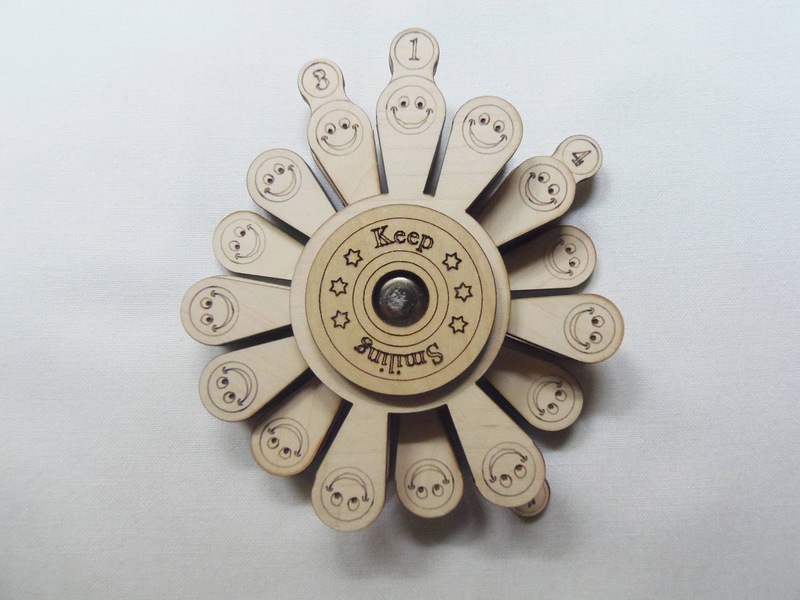 Availability: You can find the Keep Smiling puzzle at PuzzlesdeIngenio.com. Worldwide shipping available. Oskar van Deventer has done it again. Cast Twist is his latest puzzle for Hanayama's flagship series which makes him one of their biggest partners with 12 designs in his name already. Released last October, the Cast Twist, formerly known as Snake Ball, is a level 4/6 and its theme is "Tangle". The puzzle consists of two apparently similar, but distinct parts that start out entangled in each other. 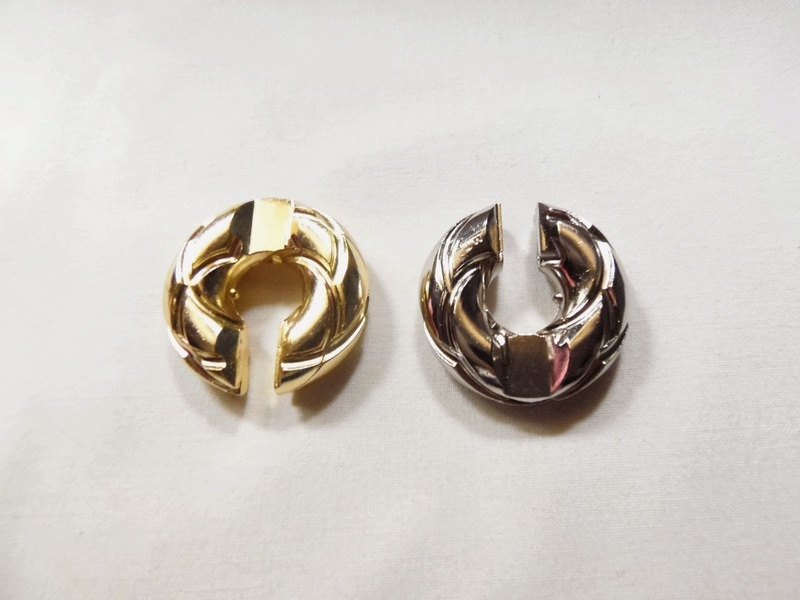 Since the two parts appear almost identical, Hanayama chose to coat them in two different colors, silver and gold. The contrast also looks gorgeous and gives the puzzle a shiny and elegant appearance. The size is slightly bigger than the Cast Donuts, with a diameter of 4cm (1.6"). The goal of the Cast Twist is somewhat straightforward, but still a bit overwhelming due to all these grooves that criss-cross the entire surface of the puzzle. 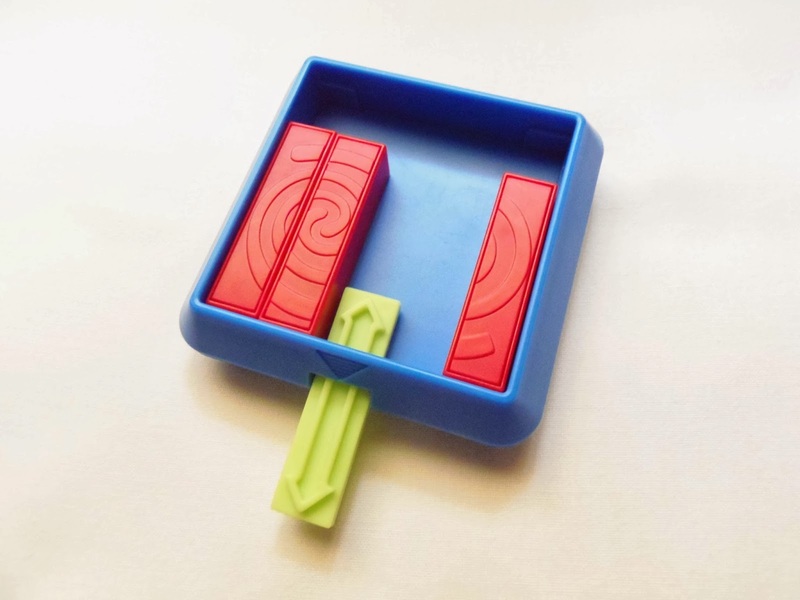 There's a protrusion in each piece that you'll be able to use in order to navigate both mazes, so you should pay attention to their position at all times, albeit being difficult at times, because of the tight tolerances between the two pieces. The first movement that you'll be able to perform will be to slide the gold piece across the silver one, but you'll be immediately stopped with almost nowhere to go. The only course of action is to study which path the silver piece should take, and at first your options are limited. As you move further along more paths will open, but so will do many dead-ends. It's here that the puzzle becomes tricky, and solving it will require a good dose of trial and error, but that alone won't get you far. You need to figure out how to get to the exit. As mentioned above, the difficulty level of the puzzle is 4/6, but after spending almost an hour solving it and putting it together, I honestly think this one deserves a higher rating. A 5 would most certainly be a better fit for what you should expect when you try it yourself. Putting it back to its original position won't be a walk in the park either. It's equally challenging due to the long path you must take from start to finish. Solution: If you feel your brain "twisted", you can download the puzzle's solution here. Oskar's Cast Twist follows the Hanayama tradition perfectly. A superb design, combined with a fun and challenging solution, and made with high quality materials at a competitive price. It's no wonder that they sell like hotcakes. Highly recommended, as usual. 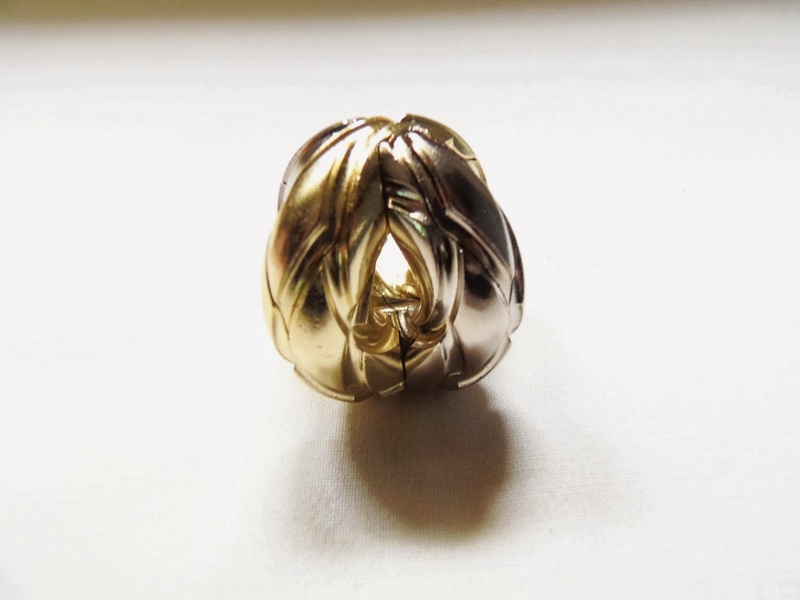 Availability: You can find the Cast Twist, and all the others in the Hanayama series at PuzzleMaster. 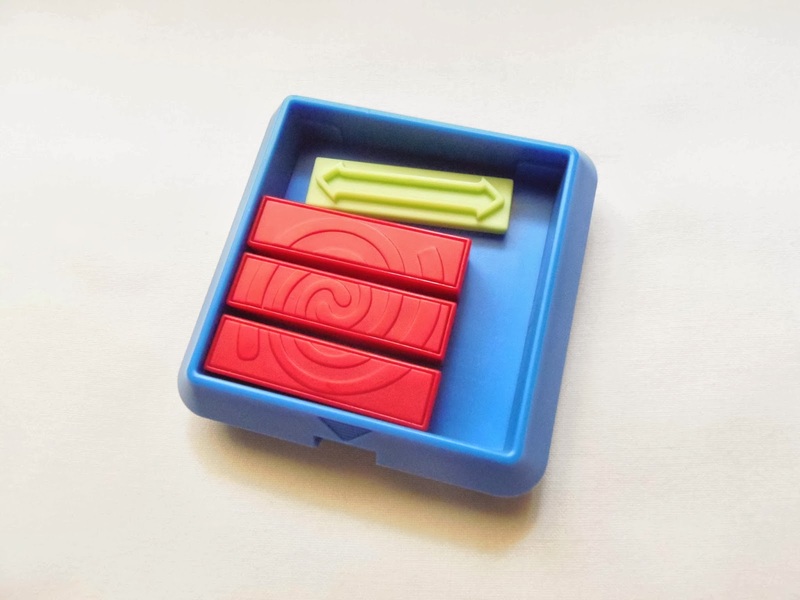 Straight Arrow is ThinkFun's version of an older puzzle, the Rectangular Jam, designed by Hirokazu Iwasawa and presented at the 25th IPP Design Competition in 2005, which ended up winning the Honorable Mention award. The original version was made from wood, but ThinkFun, as usual in their puzzles, made it using bright colors and plastic. The end result is arguable, depending on your taste, but the essence of the puzzle remains the same - A fantastic puzzle. Straight Arrow belongs to ThinkFun's a-ha! series, which present several challenging puzzles at quite an affordable price. They're quite small, but don't judge them by their size. These will make you think. The goal of the puzzle is simple: There are three identical planks and a green arrow. The starting position shows all rectangular pieces perpendicular to the exit. All you need to do is to find the correct sequence of moves, without removing or lifting the red pieces, and be able to slide the green arrow out of the tray. Only a few moves are necessary, but they're not at all intuitive, so you're gonna need to think outside the box to solve this one. Before you even move any piece you should already have an idea of what you're supposed to do. If the pieces are arranged in a different orientation from the one you need, then all or some of the pieces should be rearranged to accommodate the desired orientation for the green arrow. How you'll be doing that is a whole other matter, and I won't spoil the solution for you. When you finally discover the solution you'll definitely have an "a-ha" moment. This is classified as a level 3/4, and I reckon is pretty accurate. It took me about 10 minutes to solve. ThinkFun's Straight Arrow is a very creative challenge for anyone. It's not too difficult, but nonetheless challenging and rewarding once solved. It's also worth taking a look at other puzzles in the a-ha! series. Availability: You can get a copy of the Straight Arrow puzzle at PuzzlesdeIngenio.com. Worldwide shipping available. ThinkFun always seems to surprise us with their imaginative and creative designs. In a puzzle market filled with so many different concepts it's becoming ever more difficult coming up with fresh ideas. For ThinkFun, at least for now, that's not a problem. The game was developed by Mark Engelberg (game rules) and Serhiy Grabarchuk Jr. (game challenges). 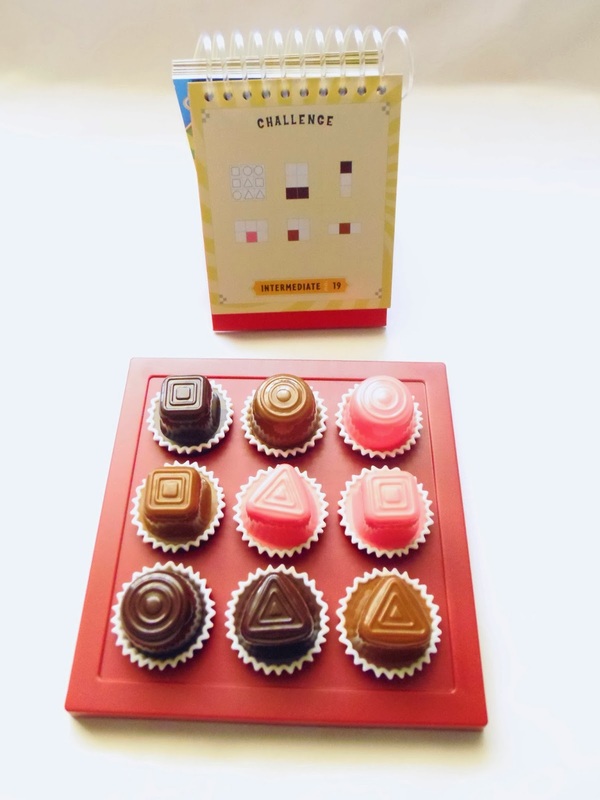 Chocolate Fix is unlike any other logic game. It's not as easy to understand at first, but once you get to know it it'll become extremely addicting. The idea behind the game is reminiscent of Sudoku, since you use the same logical deduction to solve each puzzle, and as you place more objects in the game grid it gets progressively easier. 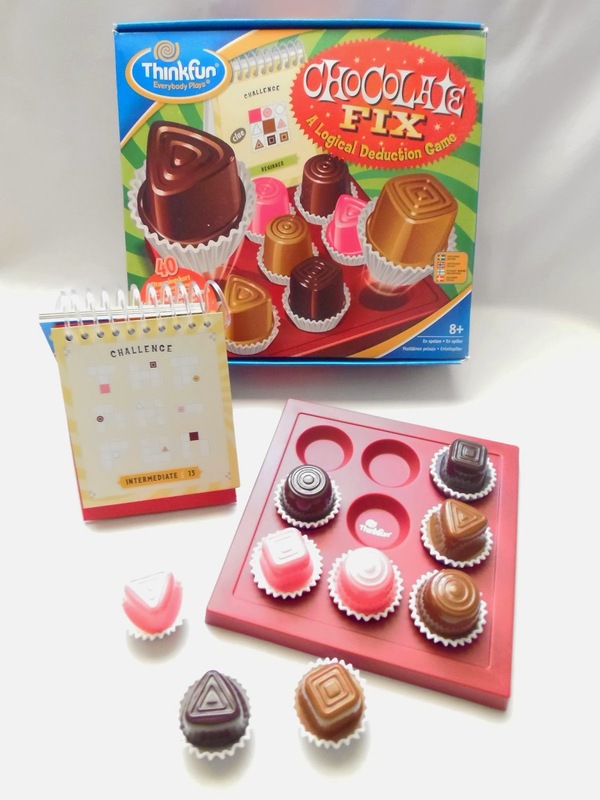 Chocolate Fix is also a bit different from other logic games. To solve each puzzle you have study many clues and figure out where to place all nine chocolate pieces. 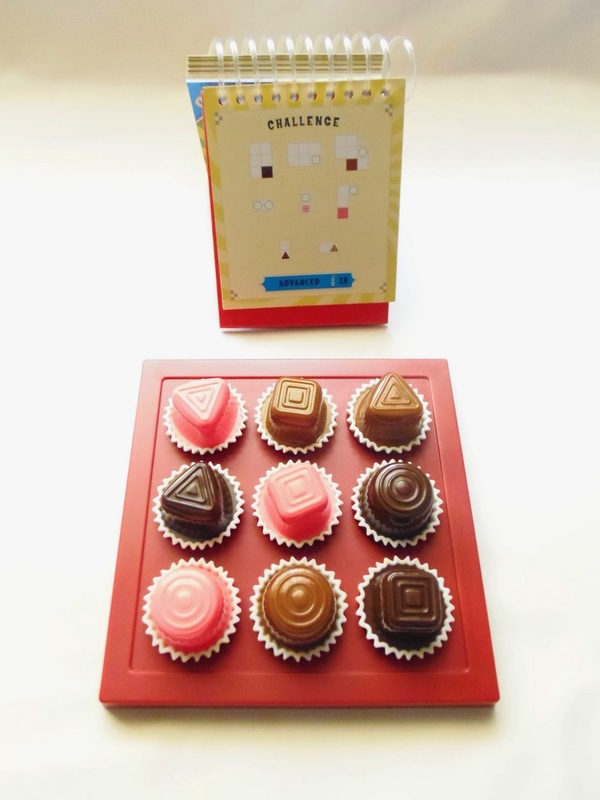 You need to be constantly looking to the challenge card, unlike many other games where you set the puzzle using a challenge card and concentrate only on the tray afterwards. It's much more demanding, but also much more interesting. I guess part of the reason I liked this game so much is because I used to be hooked on Sudoku puzzles and see a correlation between the two. So what does the game consist of? 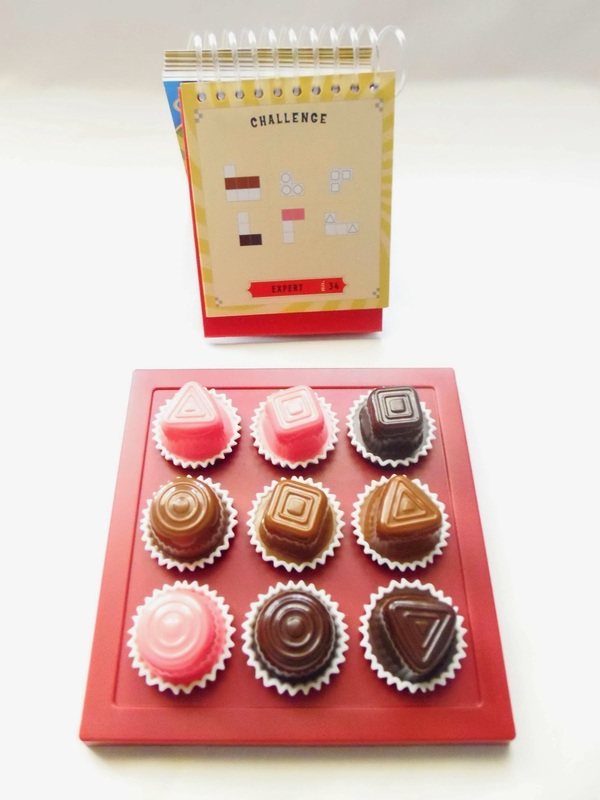 You are given nine distinct chocolate pieces in three different colors and shapes. The game grid is 3x3 and all spots need to occupied for a puzzle to be solved. Unlike Sudoku, the idea doesn't have anything to do with avoiding repetition. You can have identical colors or shapes adjacent to each other or on the same column or row. The goal is just to find the correct pattern as given by the clues. The clues will vary depending on the difficulty level. They could point to a color, a shape, both, or even part of the grid, which usually doesn't tell you exactly where it is. There are a total of 40 challenges divided in four different levels of difficulty. The beginner challenges are quite easy to get you started, but the fun starts where you reach the intermediate level, and by the time you get to expert you'll see they're as tough as any challenging Sudoku puzzle. On the later challenges, I sometimes had to take a chance and see if it some pattern worked like I thought, because the clues didn't seem enough to have a concrete answer. If I was wrong, then it should be the other way around. It's a great feeling when you're finally able to complete a tough challenge. Availability: You can get a copy of the Chocolate Fix game at Sloyd for €19.66. Parcel Post is Jean Claude Constantin's version of a classic puzzle whose origins date back to the early 20th century. Its designer is unknown, but many craftsmen have made their own versions over the years. Constantin's personal take on the puzzle is one of the best-looking ones out there by using a variety of wood colors, as he accustomed us in so many of his designs. Comprised of 18 pieces, mostly with varied dimensions (only three pairs of pieces share the same dimensions), Parcel Post has all the ingredients to make it a very hard puzzle to solve. Indeed, I don't remember having (trying) to solve such a difficult puzzle since Calibron 12 - That was one and a half year ago. 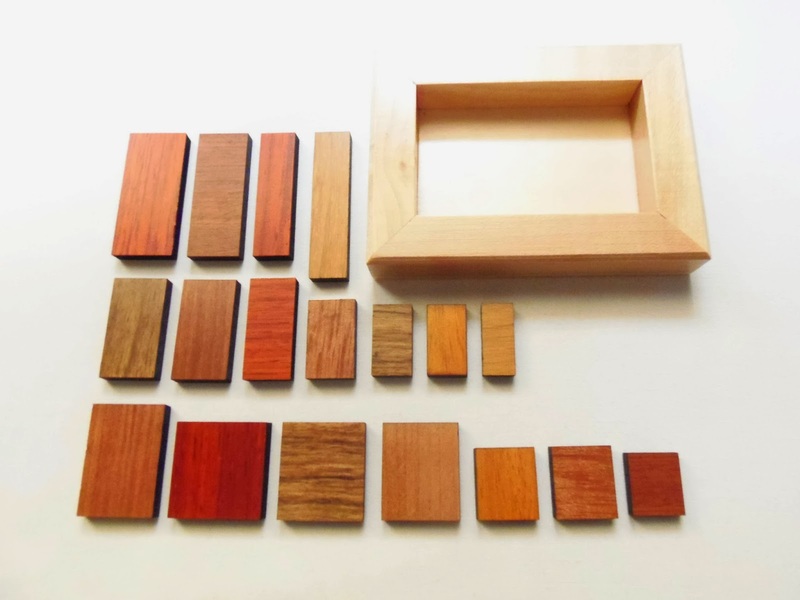 The dimensions of the tray are a bit on the small size, measuring 10.2cm x 7.5cm (4" x 3"), but with all these pieces and different wood colors it's understandable to keep the price down. If you're not already intimidated by the puzzle, you should. This is one of those puzzles that's virtually impossible to solve without a careful mathematical analysis or without software. Randomly packing the pieces by trial and error won't get you anywhere, and looking at how the puzzle looks like when solved you get a pretty good idea of where I'm getting at. The solution is anything but intuitive. There are some pieces that need to be packed vertically and, also having to pack them in three layers doesn't help either. 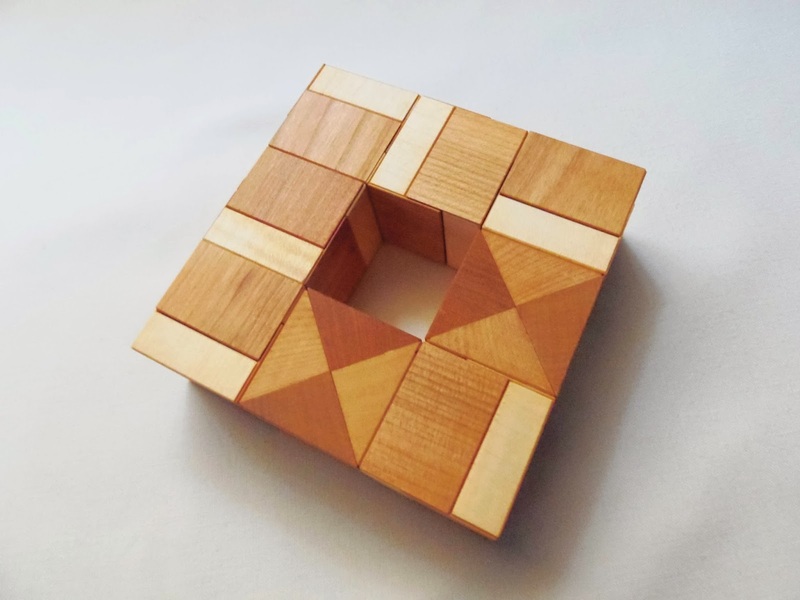 Because the puzzle comes packaged in its solved state you get to have a peek at how the solution looks like, but if you really want a challenge, ask someone to take out the pieces for you. This puzzle is classified as a level 8/10, but from my experience with these puzzles and minding all the above facts, I have to say, this is a level 10. Even though four solutions are currently known (courtesy of Bill Cutler), those weren't discovered by trial and error. A computer analysis was needed to get to that conclusion. I guess I don't need to tell you that, so far, I wasn't able to solve this beast. I did managed to put it together, but not without the help of photographs of the various stages. Unless you have a pretty good mathematical background, or you are a serious collector, I would advise to stay away from this one. It's extremely difficult and only the most courageous of the puzzlers should tackle it. Availability: Parcel Post is currently out of stock at PuzzleMaster, but you can still browse from many other interesting designs from Constantin. The name of each Japanese Puzzle Box is self-explanatory. You always know what to expect. The first part of the name refers to the actual size of the box. In this case, 2 Sun, which is 6cm (2.4"). The most common Puzzle Boxes usually go from 2 to 4 Sun, but they can go as high as 12 Sun, the largest I've seen so far. The second part of the name refers to the number of steps required to open the box. Here, the number varies greatly depending on the complexity of the box, but more steps doesn't necessarily mean a harder challenge. I have a Mame (the smallest sized boxes) 22 Steps Puzzle Box and it's much easier to solve than the one featured here, with 12 Steps. It all comes down to complexity. Finally, the last part of the name refers to inlaid work pattern you see in the box. 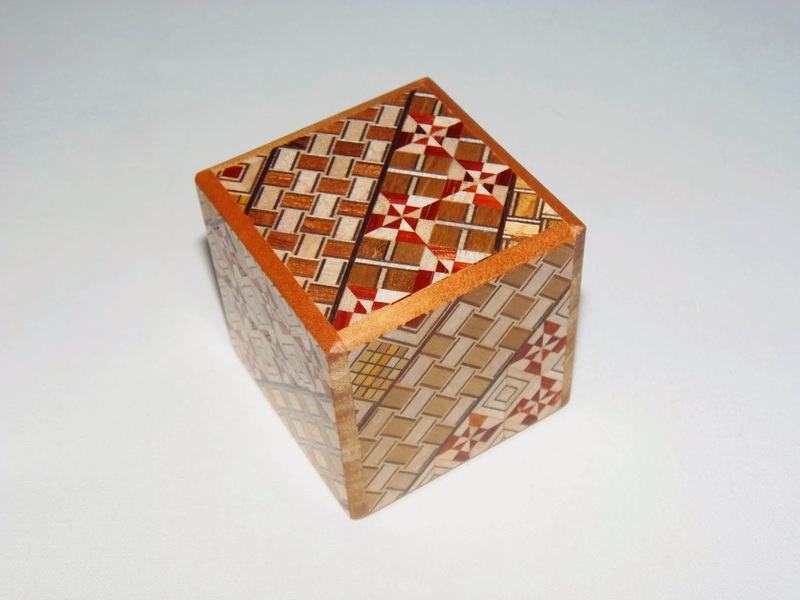 Koyosegi is the designation of this Cube, which was crafted by Hiroyuki Oka. Usually, Japanese Puzzle Boxes are rectangular-shaped, but there are also special shapes, and that's why I went for a different one this time. The solving process is always the same, although each box has its own unique solution. The goal is to find, hidden in the box pattern, sliding panels that should be moved in a specific sequence. The puzzle is solved once you can slide the lid completely off. For someone looking for a challenge, Japanese Puzzle Boxes might not be the best option out there. If you think that you'd be disappointed. 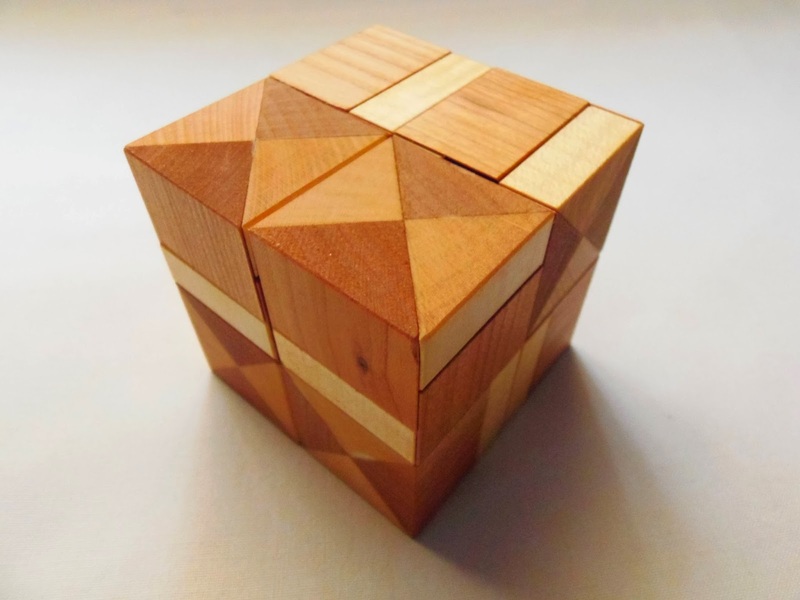 Sure, there are Puzzle Boxes out there that can require hundreds of steps to open, even over 1000 steps, but the vast majority of them are fairly easy to solve, and considering how expensive they can be, not everyone can justify their purchase. My latest acquisition took me about 10 minutes to solve. It consists of only 12 steps, but there were some that required a more careful observation. Nevertheless, I was still satisfied with it, despite not being too challenging, and always find these quite fun to solve. Wood used in the Koyosegi Cube: Katsura, Agachisu and Hakone Yosegi-Zaiku. If you end up choosing to buy a Japanese Puzzle Box, I'm sure you're looking for something more than just a challenge. You want something different, out of the ordinary, a collectible, something to display and show off. A Japanese Puzzle Box can fill all those needs and some more. I'd have dozens of them if I could, but so far I'm quite happy with the ones I currently own. 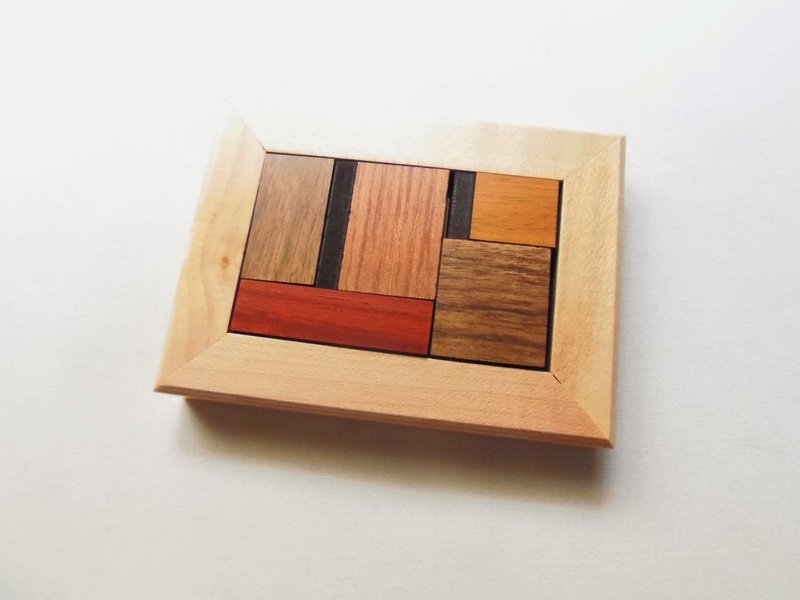 Availability: The particular Japanese Puzzle Box you see here is currently out of stock at Brilliant Puzzles, but you can still browse their dedicated page and check out many other models. 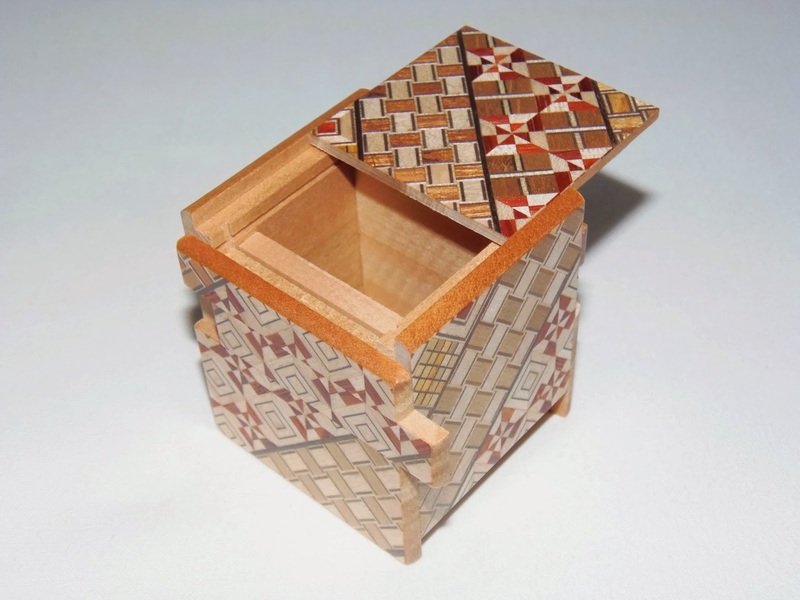 To find out more about Japanese Puzzle Boxes, read my previous review for two other boxes.